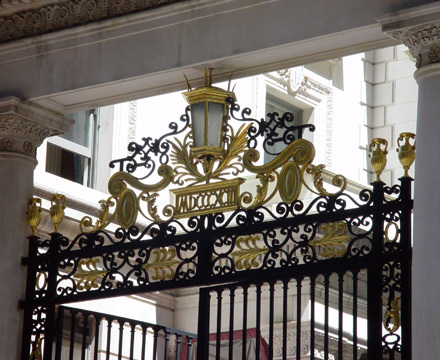 The city's grandest palazzo, the Metropolitan Club, shown above, was organized by J. P. Morgan in protest against not being admitted to some of the city's other exclusive private men's clubs. 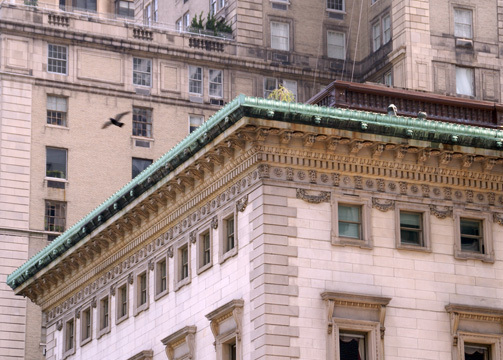 This is Stanford White's most sumptuous and lavish work in Manhattan. Its supremely elegant white marble exterior with its strong accents and regal demeanor is but a hint of its very lavish and spectacular interiors. Charles McKim's University Club further down the avenue at 54th Street actually has more impressive interiors, but a decidedly more somber less extravagant air about it. As Morgan was wont to say, if you have to ask the price, forget about it. This club, whose cornice projects 6 feet from the building's walls, flaunts its stuff in the grandest traditions of merchant princes only interested in the very best piece de resistance. The building's entrance is remarkable. It is approached through a very wide, tall and elaborate gate that opens onto a large curved courtyard framed by the rear and the east by a two-story wing and on the west by the four-story main clubhouse. The asymmetrical composition was somewhat balanced by Ogden Codman Jr.'s 6-story addition at No. 3 that was designed for bachelor quarters. In the late 1960's, a small room with very tall ceilings and a fireplace could be rented for the night for about $25 by members. The club subsequently leased this east wing to the Canadian Club and in 1993 it was leased to the American Academy in Rome, which had been also designed by McKim, Mead & White. In 1987, the club agreed to lease its undeveloped air rights to Park Tower Realty, headed by George Klein, who commissioned James Stewart Polshek and Partners to design a 37-story luxury apartment tower to rise above the courtyard and the east wing. The plan, shown at the right, set off a major preservation controversy that ended with the city's Landmarks Preservation Commission declining to issue a certificate of appropriateness for the plan. The commission's decision was deplorable, a complete capitulation to the anti-development forces that had outshouted virtually all voices of reason, or at least architectural awareness, in the city. The Municipal Art Society and other civic groups conceded that the design was "handsome" and admirable, but argued it would compromise the Upper East Side Historic District of which it was a part. Many civic activists claimed that the principle was that the area could not tolerate more density, but since the proposal only called for a total of 51 apartments, their argument was not intellectually convincing. Furthermore, the more important context was not the Upper East Side Historic District, but the Plaza District, the city's premier cosmopolitan showcase! When members of the architectural and development community learned of Klein's plan to use the club's air rights, most were horrified as the club was one of the rare genuine landmarks of true architectural distinction among the city's large inventory of officially designated "landmarks" and it was hard to conceive how such a large project could not severely violate the architectural integrity of the club and its great courtyard. Polshek, however, dumbfounded everybody by performing the magical feat of violating neither the courtyard nor the club's great interior spaces. He designed a limestone tower that was very compatible with the club's exteriors but also strikingly sophisticated and a strong statement of contemporary styling. The projecting window treatment on the proposed tower's Fifth Avenue side was as classically modern as Lever House, but it had a large cornice to echo the club's and its top had multi-story columns to thematically repeat those used in the club's great entrance gate. Moreover, the protrusions and recesses of the tower's plan created a rich visual interest that stopped short of overwhelming both the club and the adjacent Pierre Hotel (see The City Review article) that already loomed over the club. Furthermore, Polshek stopped his tower at a height significantly below the great mansard roof of the Pierre and positioned his tower considerably back of the Pierre tower's west front. Indeed, the Polshek tower covered over most of the Pierre's blank walls on its south facade where the hotel's elevator bank was located. Polshek's siting did not interrupt the park and midtown views from the Pierre's west corner apartments and hardly impinged at all over the main clubhouse. Viewed from the west, however, the Polshek tower was flush with the Pierre and therefore added a degree of bulkiness to that hotel's rather slender shaft. Ideally, some space between the two towers would have retained more of the Pierre's soaring élan, but that was not possible without building in the courtyard, shown below, or cantilevering over it, neither a very acceptable solution. Polshek's solution, in retrospect, was quite similar to Cesar Pelli's marvelous addition of a skyscraper tower to Carnegie Hall that raised no hackles among preservationists whose record of consistency since the belated creation of the city's Landmarks Preservation Commission in 1965 has been abysmal. The Klein/Polshek design was brilliant and should have been built. The main feature of the Metropolitan Club's interior is its great central hall with a grand staircase on its north side facing a massive fireplace on its south side. At the second level, the hall was ringed on its west, south and east sides by a handsome broad arcade leading to a variety of gaming and meeting rooms and a much smaller staircase leading to the third floor dining room overlooking Fifth Avenue. The main central hall is exceptionally bright because of its polished white marble walls. A large attractive bar room occupies most of the first floor's south end overlooking the sidestreet while the entire Fifth Avenue frontage on this floor is occupied by a spectacularly ornate reading room that often is converted to a dining room for special banquets and balls. Unlike some clubs, the Metropolitan has no special athletic facilities. It just is wonderfully palatial, which is as healthy a tonic as exists. In 2007, the club opened a setback roof-top addition that included a lounge, a skylit dining room on a raised level and a terrace. The new rooms were modern in style but very sumptuous and are a very significant addition to the club.